disABILITY - the Saracens Sport Foundation are extremely proud of our ever-growing disABILITY sport programmes that support a wide range of individuals and needs. Our disABILITY programmes offer opportunities for individuals of all ages with a wide range of disabilities. Our key aim is to support their social and physical development using sport as a catalyst for change. Saracens in schools - Saracens Sport Foundation run a number of programmes across several sports in schools across North London and Hertfordshire. Our team run a mixture of curricular and extra-curricular rugby, athletics, dance and cheerleading programmes. These programmes aim to increase participation as well as delivering educational outcomes to assist in improving attainment. Educating children on the importance of maintaining a healthy, balanced lifestyle in everyday life is also a key outcome. Get moving - Saracens Sport Foundation deliver physical activities including various forms of athletics, dance and cheerleading. Our aim is to increase the number of young people and adults participating in sport and inspire lifestyle changes through the benefits of sport and physical activity. 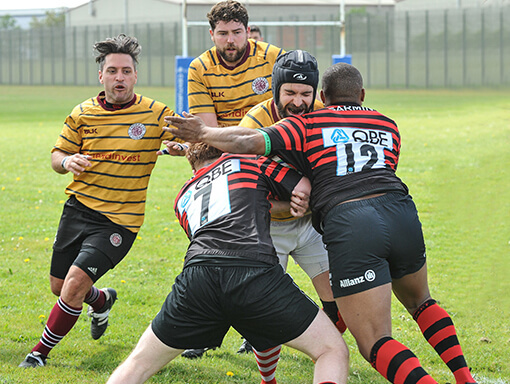 Over 50's - working within the local communities of Barnet and Hertfordshire, Saracens Sport Foundation offer multi-activity sessions for the older adult. Classes are open to men and women over 50 and provide a relaxed and sociable environment in the local community and church halls, as well as at Allianz Park. Currently our activities include Pilates, Nordic Walking and Dance and we pride ourselves on being friendly and inclusive. Our sessions offer a social environment, whether it be chatting as you walk or just a chance for a drink and a chat every week. For the last few years, participants have also had the incredible opportunity to dance at sporting stadia and take part in exciting social events throughout the year. Education and employability - through this work, we reach out to disengaged young people in our local community offering pathways into education and employment. We aim to provide the best possible opportunities to gain accreditations and qualifications by creating sustainable platforms for personal and educational development. Move Like a Pro is a free 12 week men’s health programme run in partnership with Premiership Rugby. The core aim of the programme is to increase levels of activity amongst men aged 30-55 years old who aren't currently very physically active, but it doesn’t stop there... As well as improving physical health, we also address diet changes and importantly mental well-being through social connectedness.